Finally, one trimming tool for all of your trimming needs, be it at room or cryo temperatures. The trimtool series supercedes the cryotrim and ultratrim lines of trimming tools. Resharpening is still available for these lines. The Diatome trimming blades trimtool 90, trimtool 45 and trimtool 20 will fulfill all your trimming requirements, allowing quick, easy and accurate trimming at both room and cryo-temperatures. A well trimmed sample is a precondition for perfect section ribbons. Due to the extreme sharpness of our diamond blades, less mechanical damage is applied to the sample during trimming. 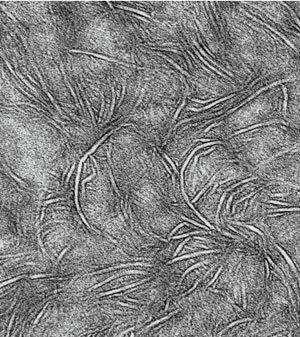 Very shiny sample faces and precise sides are the result. The trimtool 45 produces pyramidal sides with an inclined angle of 45° and the trimtool 20 produces pyramidal sides with an inclined angle of 20°. 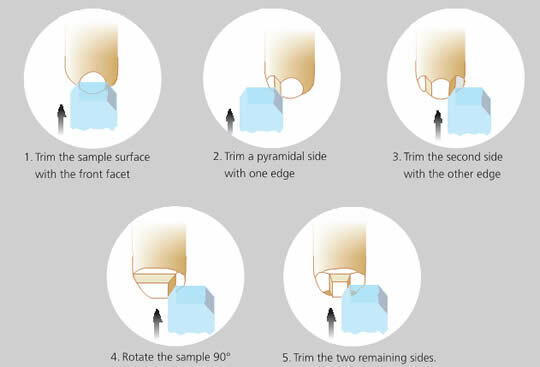 The trimtool 90 aids in the FIB cutting of biological and technical sample blocks, trimming the 90° inclined blocks sides and well as the surface of the block. 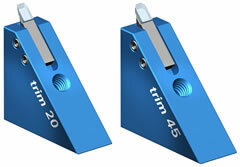 The trimtool series of trimming tools supersedes all the cryotrim and ultratrim lines. Choose a new knife in the following table. To resharpen a cryotrim or ultratrim knife, use the subsequent table. The EM Trim Diamond Cutter for the Leica "EM-Trim "
These cutters are used exclusively in the Leica EM Trim and are available in either 6 or 12 mm diameter. These blades allow for parallel edges of the complete block which is mandatory for successful sectioning. Please see our listing Static Line II Ionizer.